DENVER (July 21, 2013) – Ron Capps was content with the performance of his NAPA Funny Car team Sunday at the Mile-High Nationals at Bandimere Speedway near Denver. The veteran driver wasn’t happy that his Dodge Charger R/T lost in the second round to Mile-High pole winner and eventual event titlist Cruz Pedregon, but Capps and crew chief Rahn Tobler are focused on a bigger prize that can be attained by steady improvement. 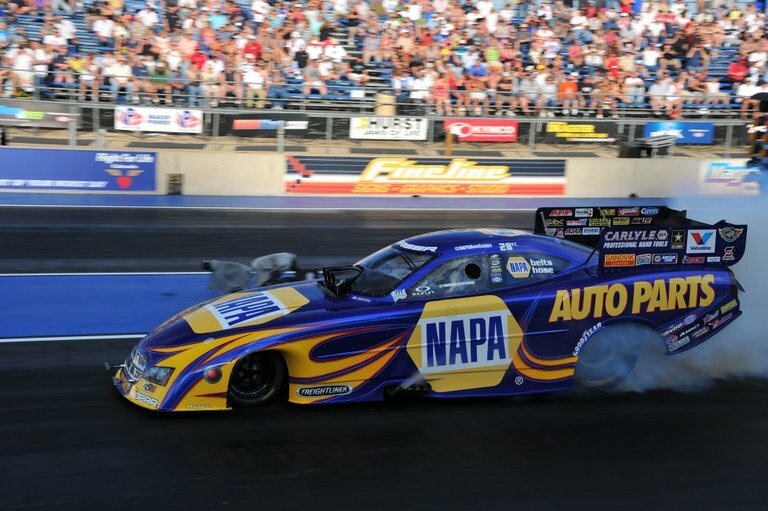 The day started off perfectly for the NAPA Funny Car team in the opening round when Capps defeated Don Schumacher Racing teammate Matt Hagan, who is the series points leader. Capps was able to chip into Hagan’s lead by 20 points by advancing one round further. “The first-round was big because we know how good that car is,” said Capps, who is ranked fourth and 104 points behind Hagan after 14 of 24 events on the NHRA Mello Yello Series. “We knew going up there Cruz would run good. We tried to go up there and not make a mistake. You have to give credit to Cruz for running great. “We made up some ground this weekend, and we’ll leave here with all the important parts we came with. We gained some ground. That’s what we wanted to do. “I’m excited for the rest of the (Western) Swing, and we’ll go on to Sonoma (Calif.) and its always been great for us,” he said of the track where he’s won three times. Join us to cheer on Ron Capps and the NAPA Funny Car team July 26-29, Sonoma Raceway, Sonoma, Calif.
2013 WINNERS: C. Force, CAPPS, GRAY, C. Pedregon, HAGAN, C. Pedregon, GRAY, GRAY, HAGAN, J. Force, C. Force, HAGAN, GRAY, C. Pedregon.